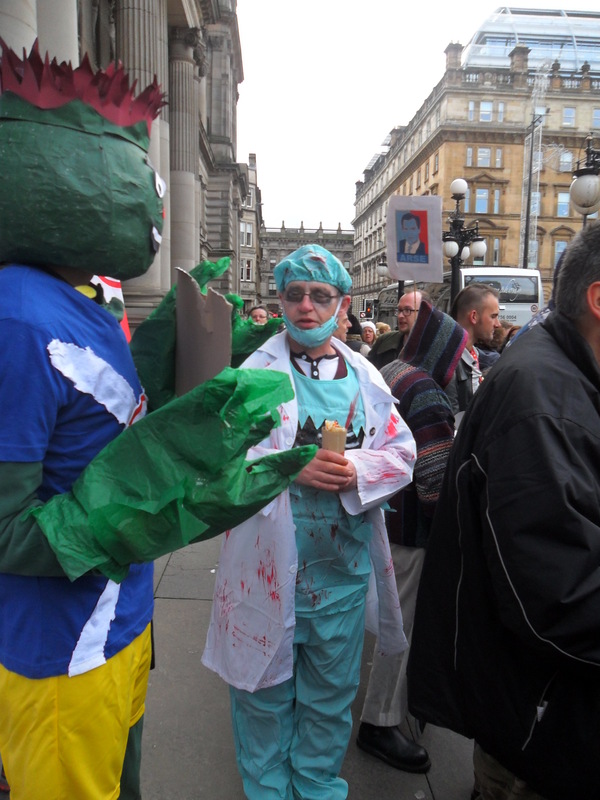 Today was an eventful day in Glasgow. 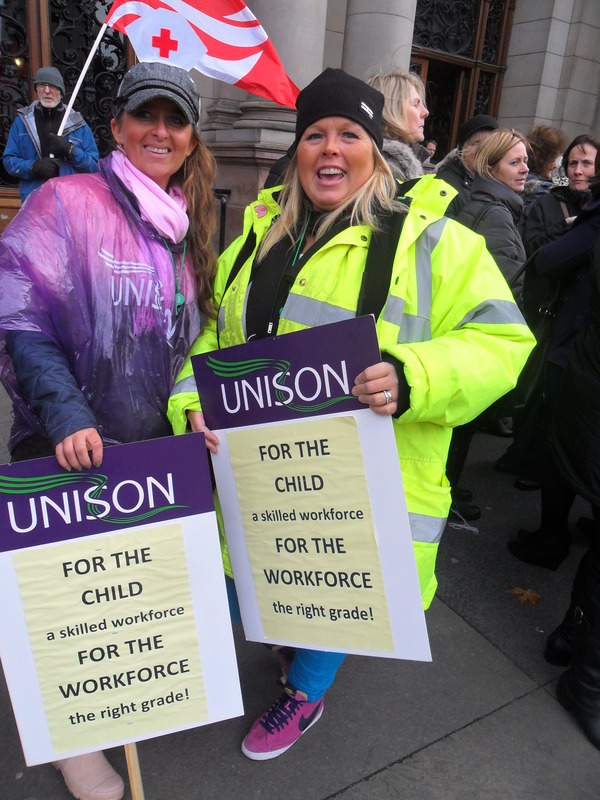 Not only were there loads of STRIKES affecting unis and schools and a contentious city council meeting at which the SNP and Labour disagreed about everything (hold the front page! 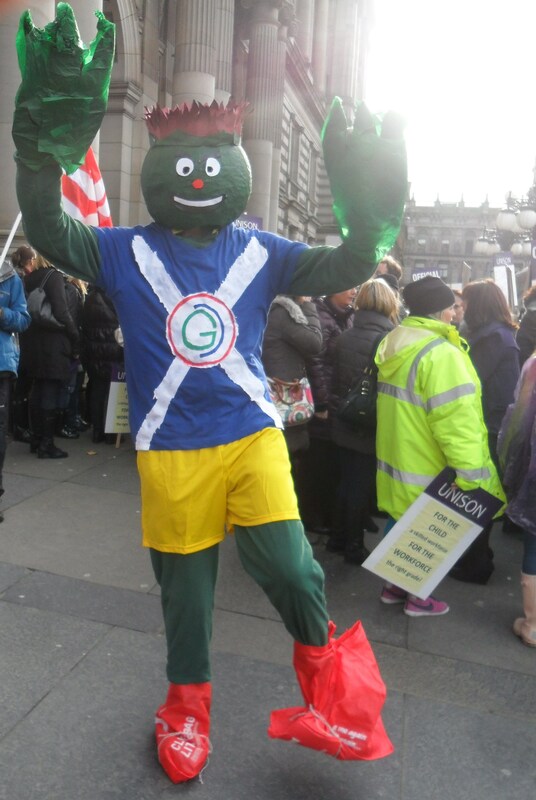 ), someone had let terrifying plant-man hybrid Clyde the Thistle, he of the Commonwealth Games, on the rampage around the city. 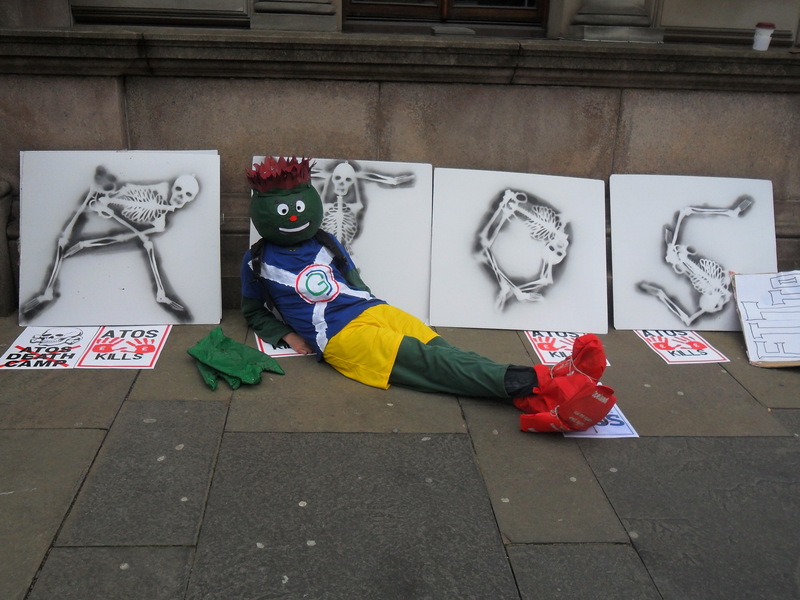 A Thousand Flowers caught up with Clyde outside the City Chambers (above) at lunchtime, as he waged a one man counter protest against hundreds of striking school workers and disability rights’ campaigners who were lobbying the council. 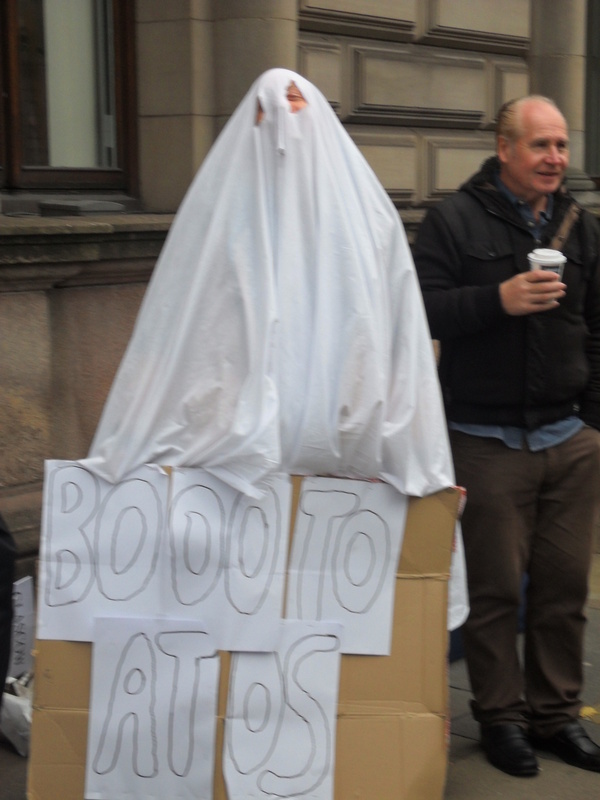 However, the big event at the full meeting of GCC was a crunch vote on ATOS, the French IT firm who since 2008 have been profiting from running part of the government’s war on disabled people, holding the contract for carrying out sham ‘fitness to work’ assessments. As it happens, they’re also a major sponsor of next year’s Commonwealth Games. Naturally, a lot of people are pissed off about giving such prestige, including puff pieces in the media with athletes posing in Atos t-shirts, to a firm who make their money kicking disabled people off benefits. 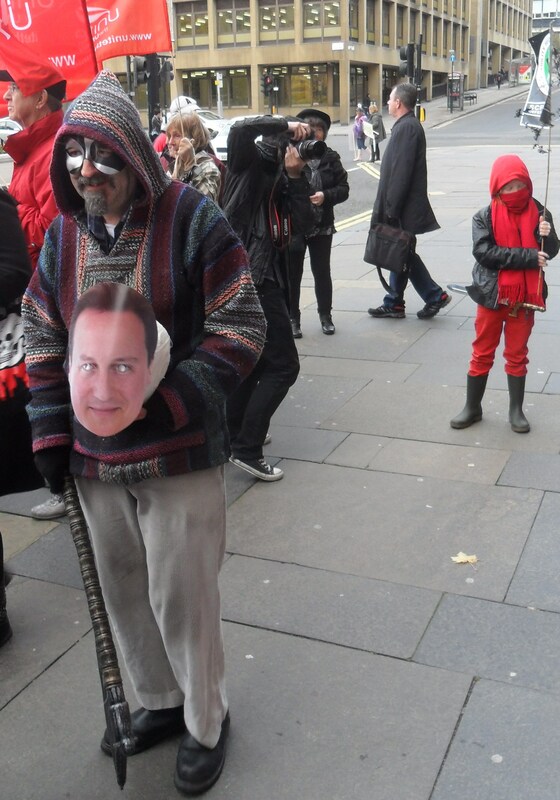 Atos are such a safe bet for public disdain that even The Labour Party have been giving them a kicking in public recently, apparently announcing that they will “axe” them if they win the next general election. However our friends at Glasgow City Labour seem to have missed this particular memo, as today every single one of them voted to support retaining Atos as a sponsor of the Commonwealth Games. 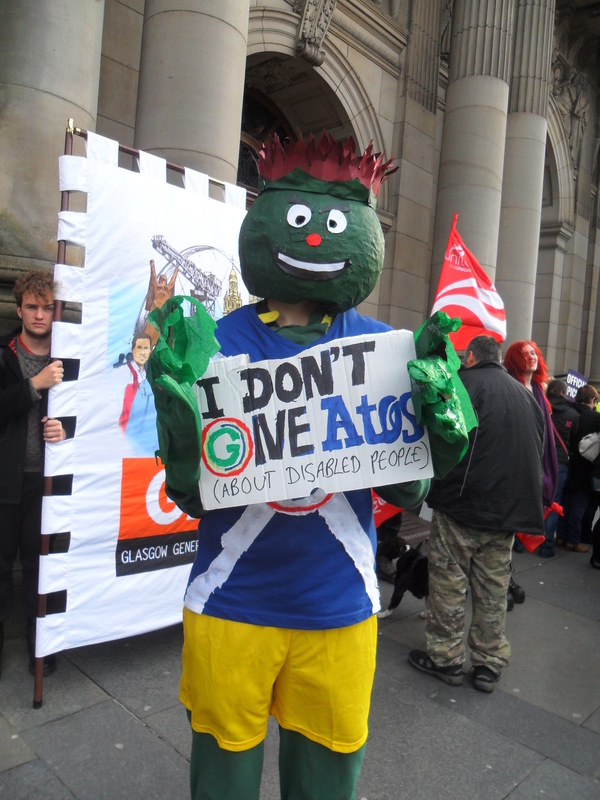 A motion put up by the SNP, if accepted, would’ve seen Glasgow City Council take a position against Atos sponsorship and lobby the Games Organising Committee to this effect. If you know the first thing about Glasgow Labour, you wont be shocked to hear that they lined up to vote this down, winning 42 votes to 29. As cooncillor Archie Graham (Johann Lamont’s husband btw) said, the dastardly SNP were just out to “deliberately damage” the Commonwealth Games with their motion, leaving our heroic city fathers no option but to defeat the Nat fifth columnists and save the Games in the process. 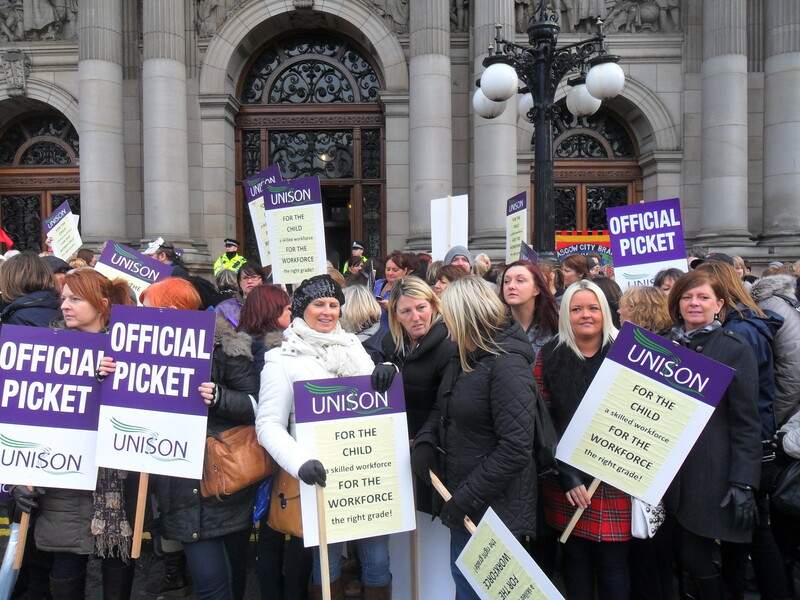 At this point the public gallery erupted, showering the chamber with monopoly money, perhaps alluding to allegations that Glasgow Labour are a bunch of corrupt charlatans. 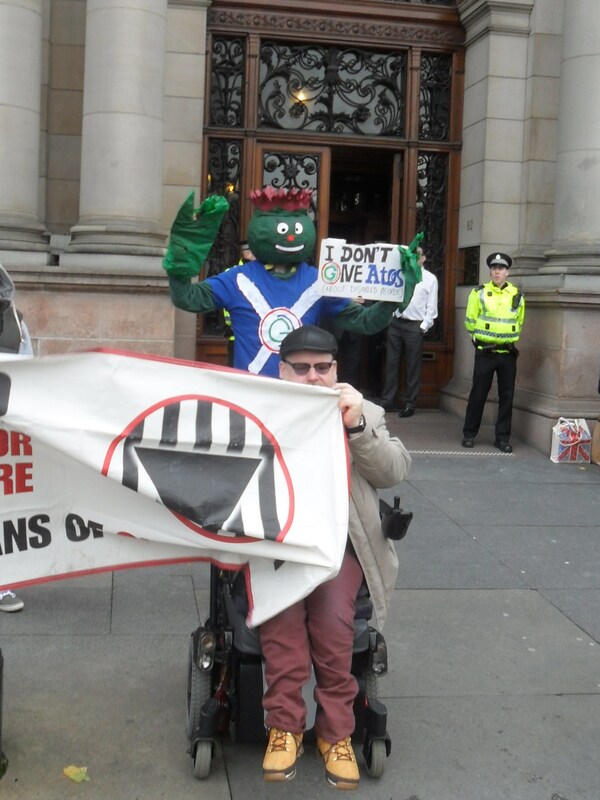 Clyde the Thistle was overjoyed though! 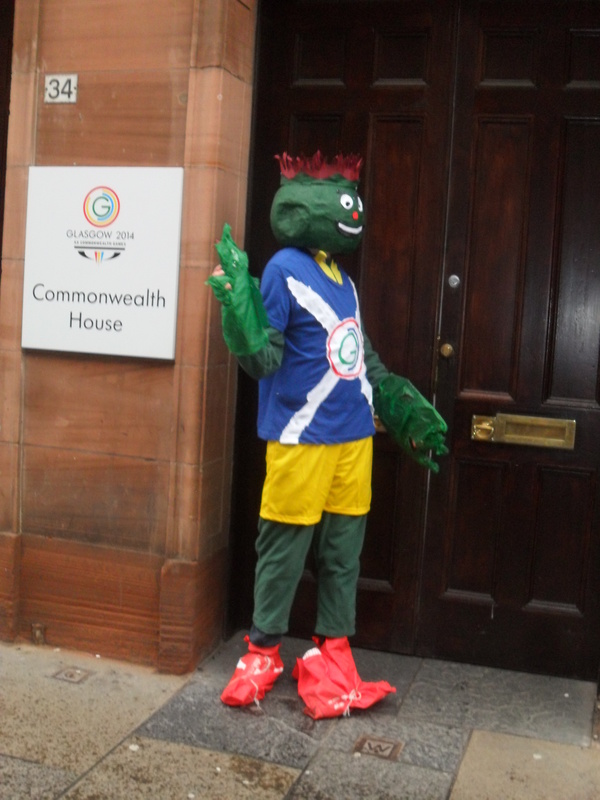 After a while, evil Clyde got bored of goading protesters and decided to head home to the Commonwealth Games HQ down in the Merchant City. Surely they would welcome him with open arms? It wasn’t to be though, as a nervous looking security guard moved quickly to… lock the doors! 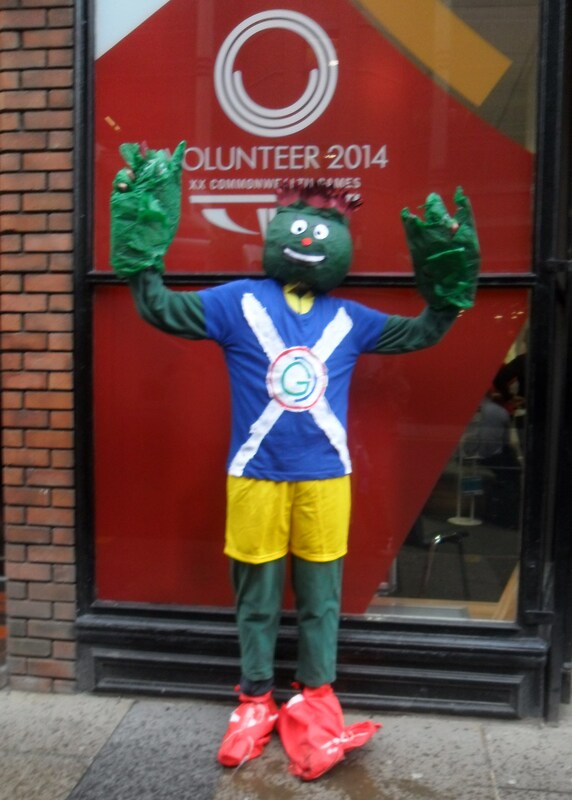 As confused old ladies who presumably just wanted to sign up for volunteering/being inducted into the cult of Clyde stood around waiting to be let in, thistle monster Clyde took the most of this opportunity to get some pics. 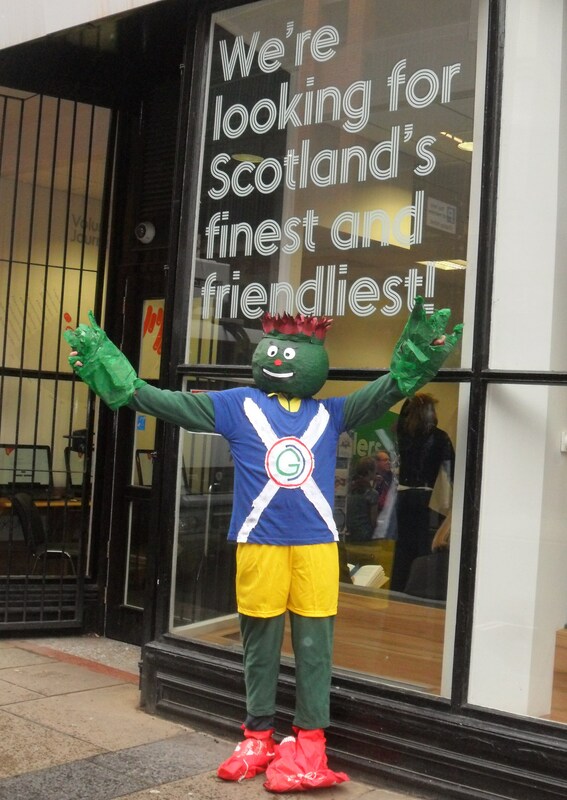 Clyde the Thistle: Just who is he? Whose City: Are the Commonwealth Games Ruining Glasgow?